This example of a museum exhibit on basic molecules allows visitors to interact by kicking physical objects around—which we call kickables. (a) This visitor starts a tutorial video by pushing a kickable from pause to play. (b) Another visitor scrubs through a different video. (c) This visitor assembles a water molecule by moving a red hydrogen atom towards a blue oxygen atom. Kickables are tangibles that users manipulate with their feet. While they maintain the affordance of traditional tangibles, kickables scale to arbitrarily large spaces as kickables reside on the ground. This affordance makes kickables well-suited for large-scale walk-up installations, such as tradeshows or museum exhibits, as illustrated by our prototype installation on basic molecular chemistry shown in the figure above. Sample widgets from the five sets of standard kickables: (a) bento slider, (b) tumbler button, (c) tessellation toggle switch (d) tracking slider, and (e) crossing button. As with traditional tangibles, kickable application designers will typically create their own custom kickables. In the shown chemistry exhibit, for example, kickables are used to represent different types of atomic nuclei. At the same time, many applications will benefit from reusable kickables. The visitor in the above figure (a), for example, starts a tutorial video by kicking the knob of a kickable switch from play to pause. To support application designers in creating kickable applications, we implemented a toolkit of five kickable sets with a total of 16 reusable kickable widgets. Each set explores a different design principle (e.g., different mechanical constraints). We expect application developers to pick one set, depending on their application requirements. (a-b) Physical constraints limit range of motion for low-friction material such as steel. (c) Compliant material causes internal friction by constantly deforming when rolling. To allow for precise manipulation, a kickable knob needs to come to rest within the intended motion range. This requires an appropriate amount of friction between knob and ground. Round kickables roll and are thus typically subject to very low friction. While this makes them suitable for large outdoor installations, on smaller to medium-size installations we need to take measures to increase their friction to a useful range. We achieve this by using a compliant material with added weight (1.6kg of lead shot) that causes internal friction as it is constantly deforming while rolling (c). Alternatively, we use low-friction materials, adding physical constraints to limit the range of motion (a-b). Tracking on arbitrary surfaces: The IR camera tracks spikeballs with retroreflective tape using standard computer vision algorithms. 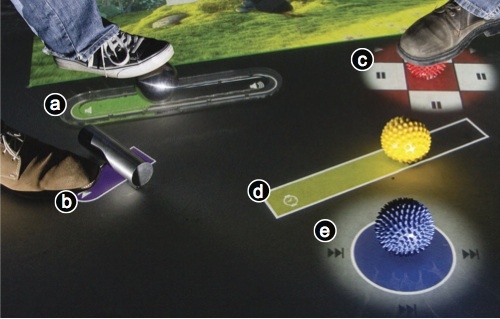 The specific kickable designs shown in this paper were optimized for use with a pressure sensing, back-projected floor. The concept of kickables, however, goes beyond the specifics of our floor-based implementation. 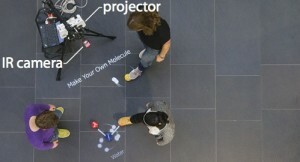 They may be implemented on a variety of floor displays (e.g., using steerable projectors) and tracked using a variety of tracking solutions (e.g., 2D or depth cameras, optical trackers like Vicon, or inertial measurement units (IMU) inside knobs).We demonstrate one such solution (based on overhead IR cameras) that allows for kickable tracking on arbitrary surfaces. Kickables is a research project by Raf Ramakers, Esben W. Pedersen, Johannes Jasper, Sven Köhler, Aileen Pohl, Hannes Rantzsch, Andreas Rau, Patrick Schmidt, Christoph Sterz, Yanina Yurchenko supervised by Dominik Schmidt and Patrick Baudisch at the Human Computer Interaction Lab of Hasso Plattner Institute. A., Rantzsch, H., Rau, A., Schmidt, P., Sterz, C., Yurchenko, Y., and Baudisch, P.
Knaust, M., Lühne, P., Meusel, R., Richter, S., and Baudisch, P.
Download high-resolution images. All images Copyright © 2013 Hasso-Plattner-Institut. In collaboration with Shahram Izadi, Steve Hodges, and Scarlet Schwiderski-Grosche at Microsoft Research Cambridge.